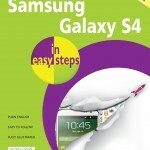 Helps you to get up and running quickly with your Samsung Galaxy S4. Covers key aspects of the Android Jelly Bean operating system. 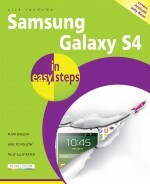 Samsung Galaxy S4 in easy steps is an informative and insightful guide to help you quickly get up and running with your new S4, one of the market leaders in Smart Phone technology. 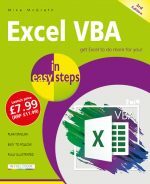 In the familiar In Easy Steps style, this title is essential in getting the best out of your new smartphone with step-by-step instructions and handy screenshots to guide you through the basics. Covering the standard functions, Samsung Galaxy S4 in easy steps navigates smoothly and efficiently around tasks and features such as working with Home screens, apps, widgets, customizing your smartphone and key aspects of the Android OS, Jelly Bean. This book also reveals the key innovative features of the S4: quickly master the Air and Smart Gestures, enjoy the exceptional camera, and make the most of its neat communications functions. Samsung Galaxy S4 in easy steps is perfect for those upgrading to the S4 smartphone, and those new to Samsung and the Android Operating System.